National Recreation Area (CRNRA). 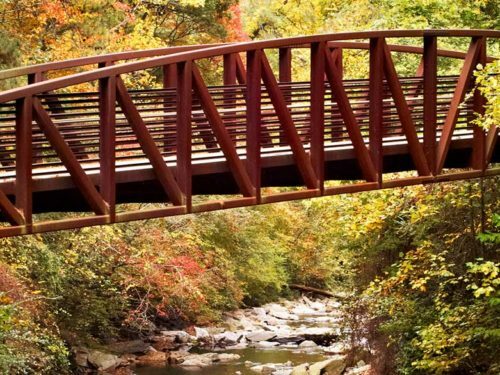 The unspoiled river and walking trails within an otherwise urban environment, provide biking, hiking, and recreational amenities directly for the Cumberland community, and connects regional trail systems such as Cobb County and the northwest Atlanta market. Construction on the center portion is expected to begin in 2017, while construction on the northern portion will begin in 2018. 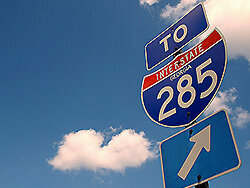 Cumberland community in Cobb County. The southern portion of the trail was completed in 2007. 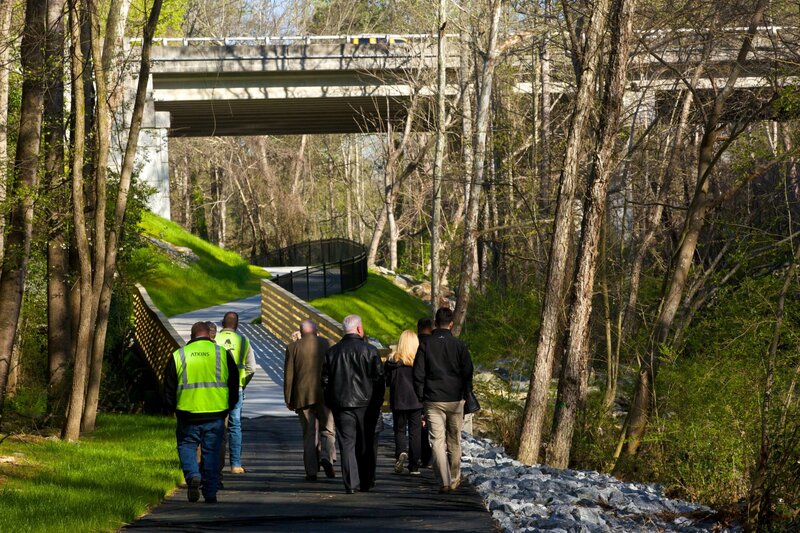 It features a 2-mile hike that follows along Rottenwood Creek and leads pedestrians and cyclists over pedestrian bridges and elevated boardwalks. south of Windy Hill Road. Resting areas with benches at each end of trail. 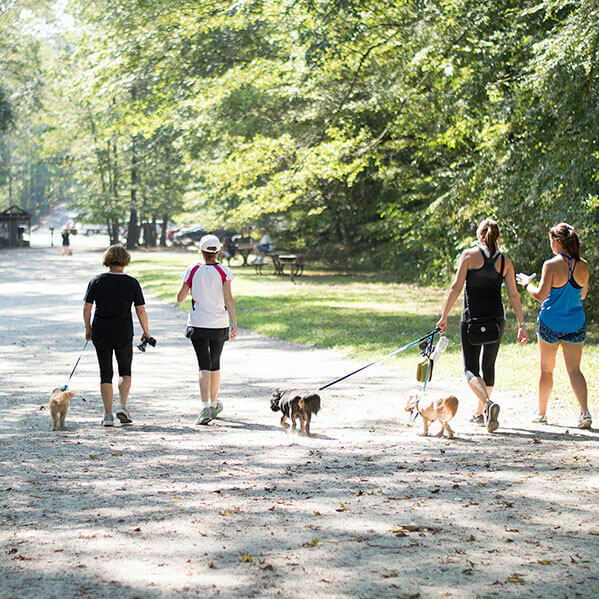 More than 2 miles long, the southern section of the multi-use trail connects 32 million square feet of commercial space to 1,200 acres of unspoiled national parkland. The southernmost access point of the trail is located at CRNRAís Palisades Trailhead at Paces Mill, and, from there, it follows Rottenwood Creek to the Bob Callan Trailhead located at the Interstate North parking lot.The multi-use trail is paved with a porous concrete designed to handle pedestrians, cyclists, and even maintenance vehicles. The porous surface allows for rain fall to filter through to the ground as well. Free parking is located on the northern end of the trail at the Bob Callan Trailhead. Parking and bathrooms are also available at the southern end of the trail at the Palisades Trailhead off Paces Mill and US Highway 41 for $3. 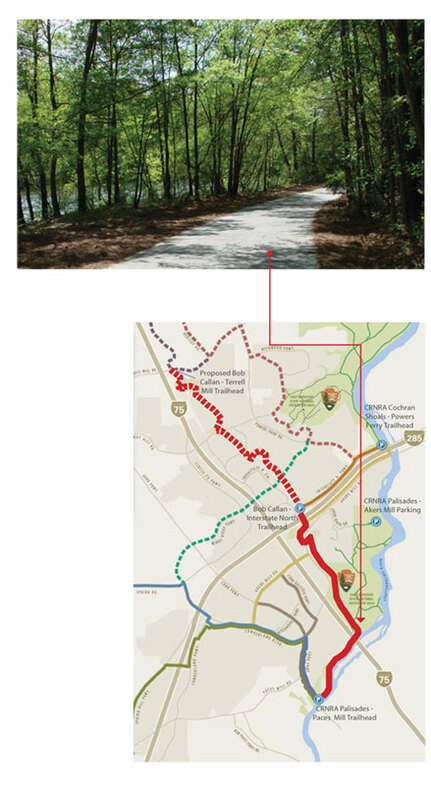 The 2 mile northern extension of the Bob Callan Trail will continue the user experience from the Bob Callan Trailhead to the Terrell Mill Road area. 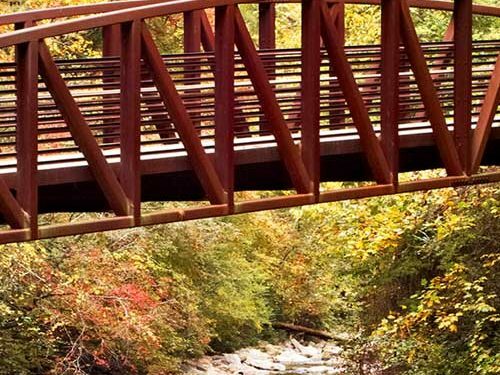 Following Rottenwood Creek, the boardwalks of the northern section will work into the natural environment around rock formations and the creek bed. A new trailhead and parking facility that will offer free parking will be constructed off Terrell Mill Road. The design is complete and awaiting funding partners for construction. 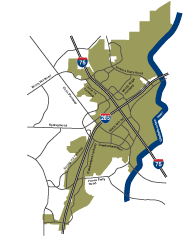 The Bob Callan Trail is part of a 25-mile network of multi-use trails in process in and around the Cumberland area, with 16 miles already constructed as shown on the corresponding map.